Happy Saturday and Happy March 1st! I slept in late this morning and woke up feeling well rested. I was in the mood for a good breakfast but didn't want to spend a lot of time making it. I had 2 of my Easy Cheddar Black Pepper Biscuits leftover from last weekend. I split them in half with a sharp serrated knife and placed them in a baking pan open faced and popped them into a 300 degree F oven to warm and lightly toast. Since I had a couple dozen eggs in the fridge, I decided to make something with eggs. I fried the eggs in a little bit of Kerrygold butter until they were done the way I like them (soft yolks that are still bright yellow/orange...but not overcooked and light yellow...and definitely not runny). I know, I'm weird...which is why I prefer to make them myself! I wanted my eggs to be a little bit special...but in a very easy sort of way. So, while they were still in the skillet, I topped my perfectly cooked eggs with Monterey pepper-jack cheese and covered the pan for a minute or 2 until the cheese just melted over them. 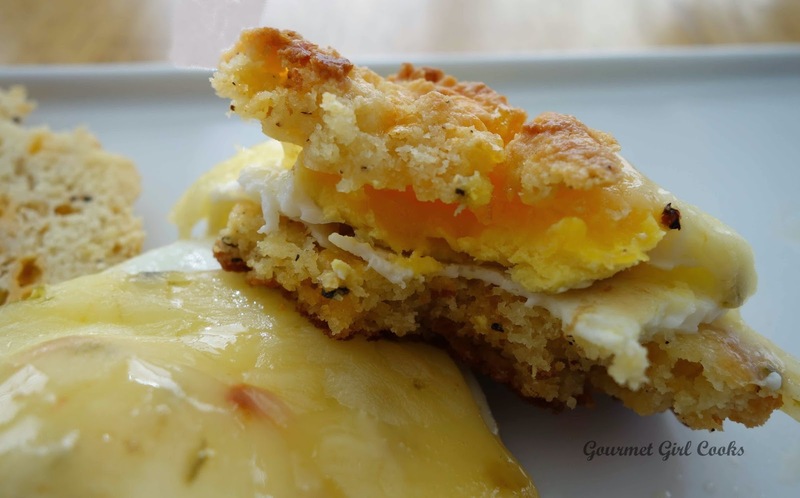 I placed the biscuits on my plate opened faced and topped each biscuit bottom with a spicy cheese-covered egg and drizzled a little bit of the melted Kerrygold butter from the pan on top. 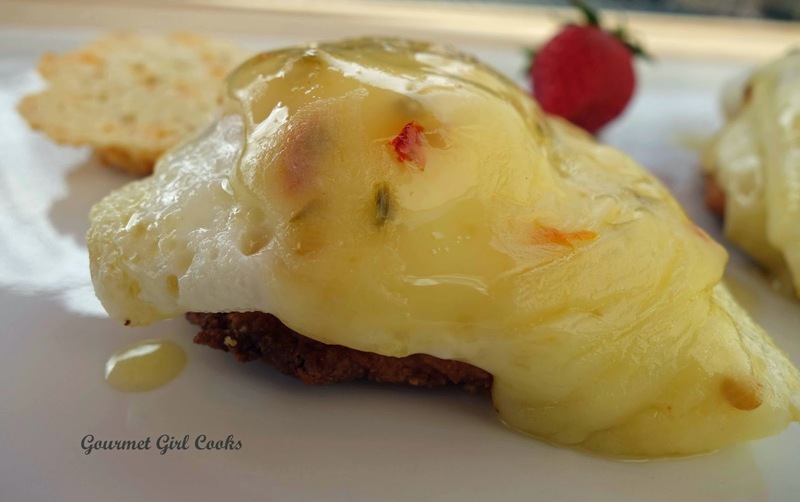 Instantly, I was enjoying "Easy Eggs Monterey"...a simple and much easier twist than traditional "Eggs Benedict". How simple is that? It was easy yet seemed more special than having plain fried eggs with biscuits! I didn't even use any salt or pepper because the pepper-jack cheese added all the flavor I needed...that along with the cheddar and black pepper already in the biscuits. I snapped a few photos below. Enjoy! Preheat oven to 300 degrees F. Place biscuits open faced in a baking pan or on a cookie sheet and heat for about 5 to 10 minutes while preparing the eggs. 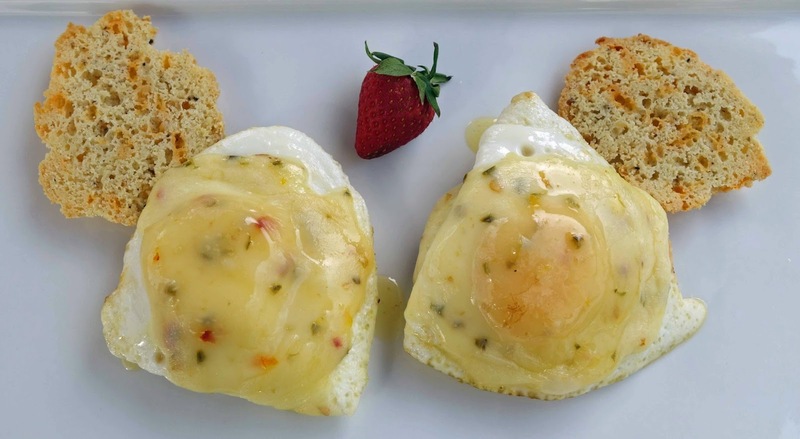 Heat butter in a 10-inch non-stick skillet over medium-high heat until butter just begins to sizzle slightly, reduce heat to medium and crack 4 eggs, one at a time, into the skillet. Cook gently until yolks are desired consistency. Covering the eggs for a minute or two helps cook them a little more quickly. 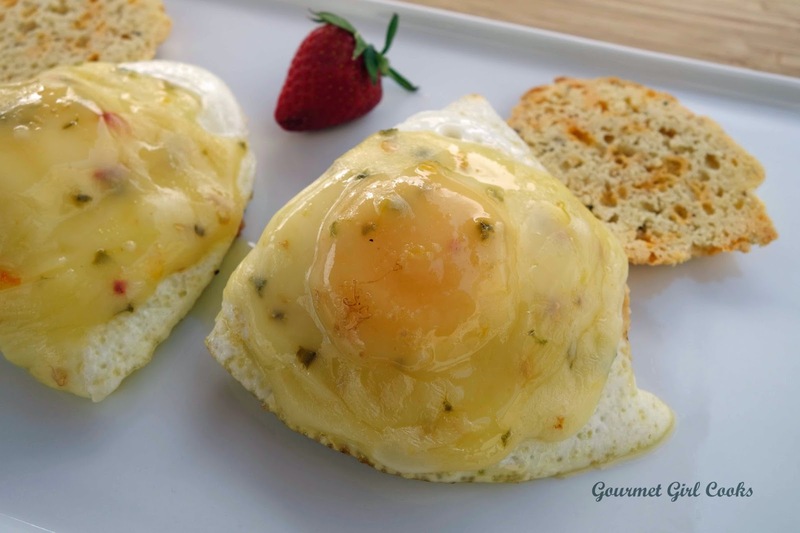 When eggs are desired doneness, remove skillet from heat and top with cheese. Cover skillet for a minute or two just until cheese begins to melt (careful not to melt it too long where it becomes liquidy and runs off the eggs). 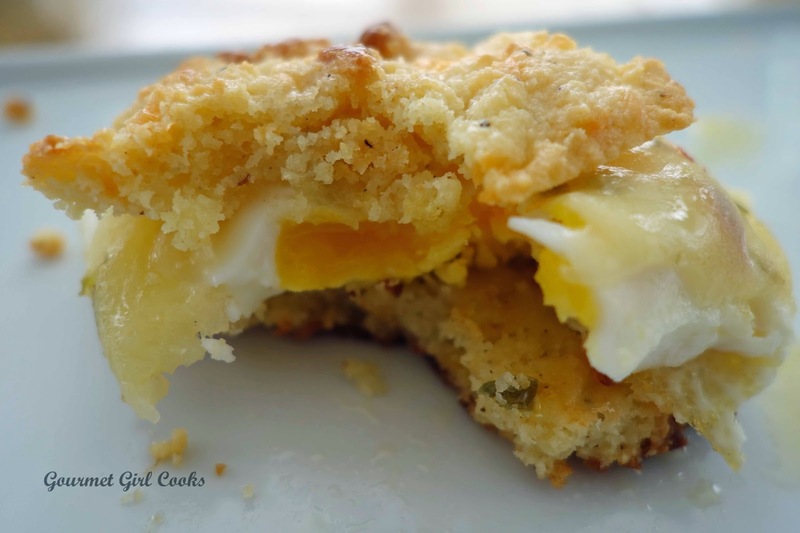 Top the bottom half of each biscuit with an egg and add biscuit top. Makes 4.